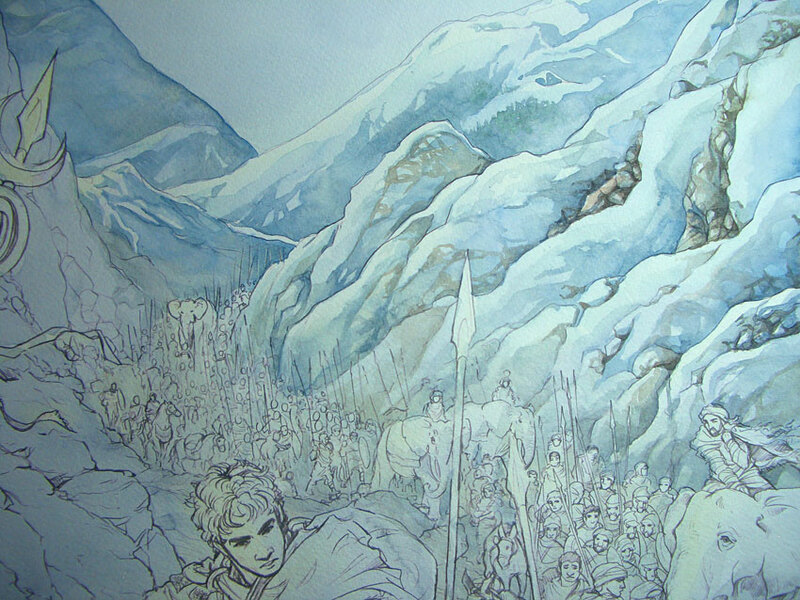 A watercolour illustration I did for author Ben Kane and his upcoming book “Eagles at War”, about the battle of Teutoburg Forest. I met Ben while we were both working on our respective Hannibal novels, and I really enjoyed his novels – and we decided we needed to do something together. 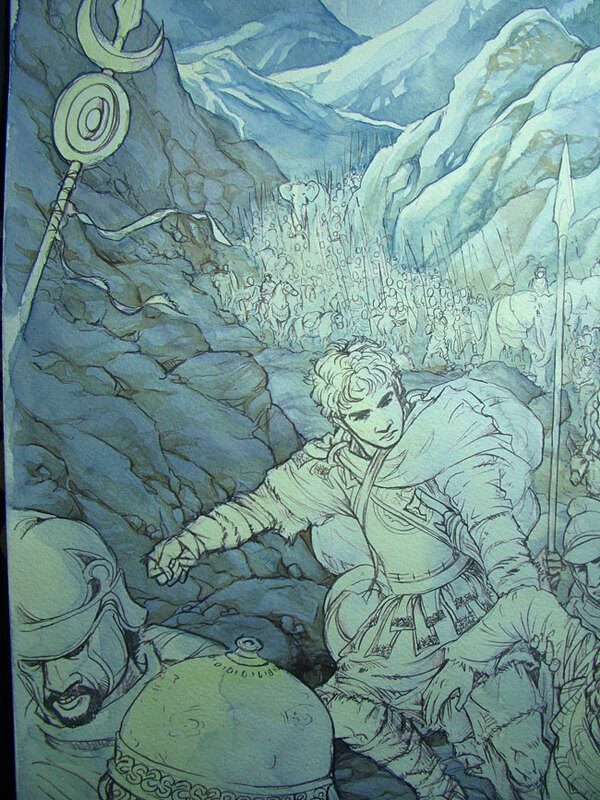 Next, I’m doing a larger painting for him, of the battle itself. Watercolour and Ecoline on Canson Vidalon cold-pressed paper, 20×30 cm. Finally, I’m having a Spring Sale in my Etsy shop! Every order of 30€ and above is -15%. Just enter SPRING15 at checkout. Take a look! 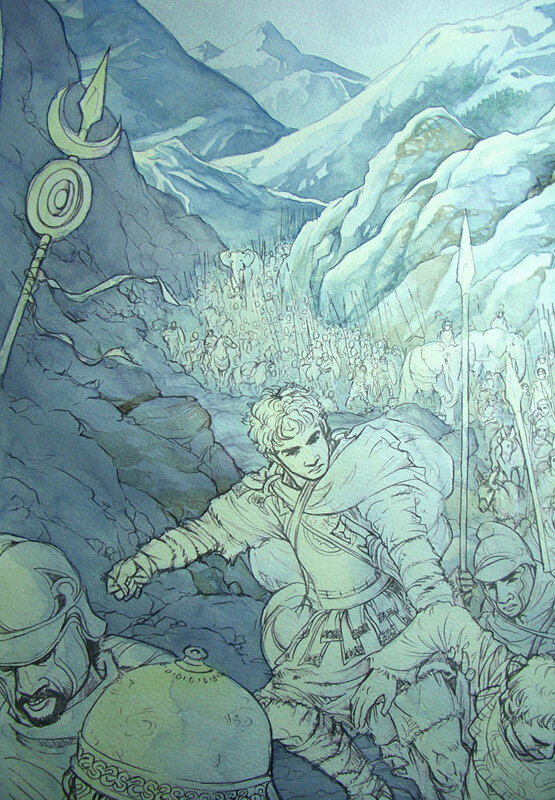 Work on “Darkness over Cannae” is well underway. 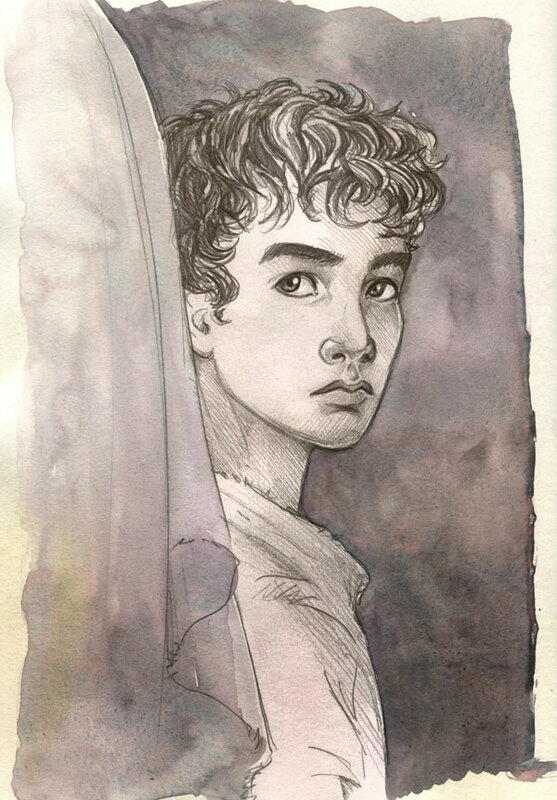 I now know it’ll be an illustrated novel – a bit like Neil Gaiman’s Stardust in form (highly recommended, by the way!) – of probably around 120-150 pages. 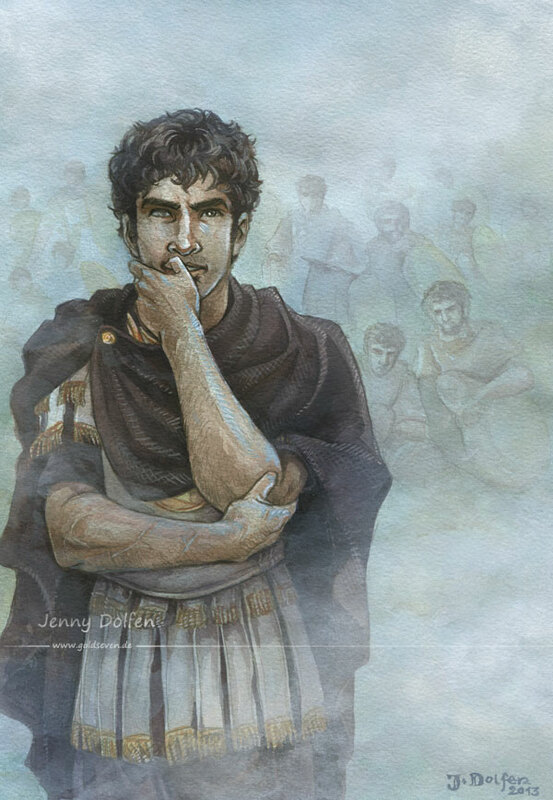 It’s all set on this one fateful day – August 2nd, 216 BC – spanning an hour before dawn to a few hours after sunset, from the perspectives of six men, three Roman and three Carthaginian. I’ve been doing some sketching, but the more finalised images and of course, greater portions of the text will not be online until the thing is done. Until then, here’s some impressions! Maharbal, Hannibal’s second in command. Quick sketch with a splash of watercolour. Top: Hasdrubal, commander of the Punic heavy cavalry. Writing him is an almost indecent amount of fun due to his wry sense of humour. 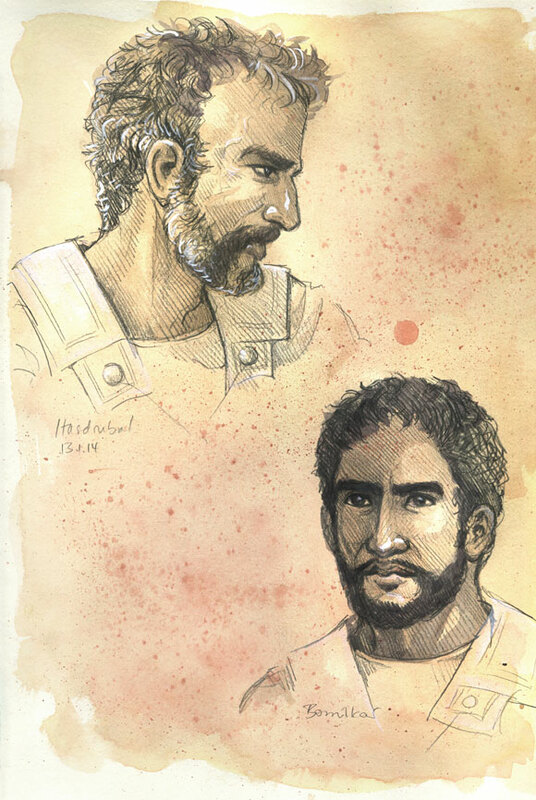 Bottom: Bomilkar, captain of Hannibal’s bodyguard. “It will, if I do,” Hasdrubal growled. Hanno chuckled; Mago snorted. 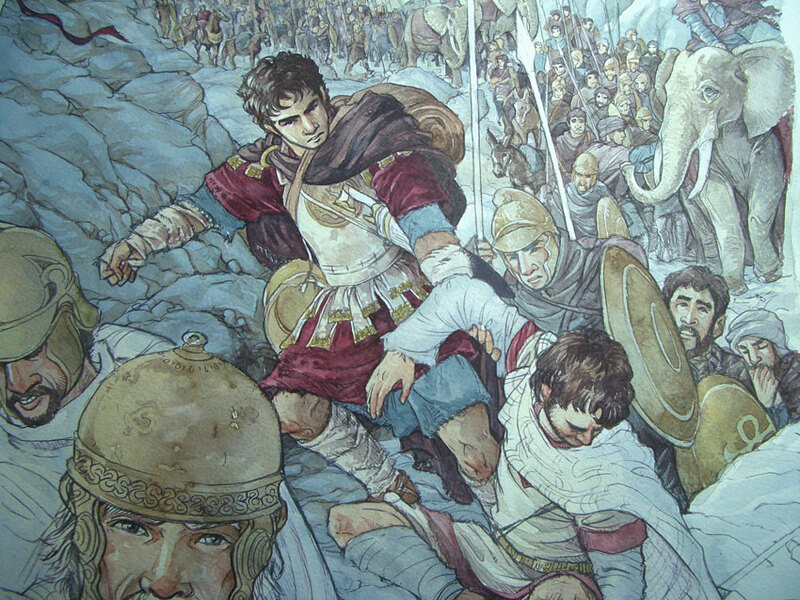 Top: After the battle, Hannibal kneels at the Aufidus, cleansing himself before praying. 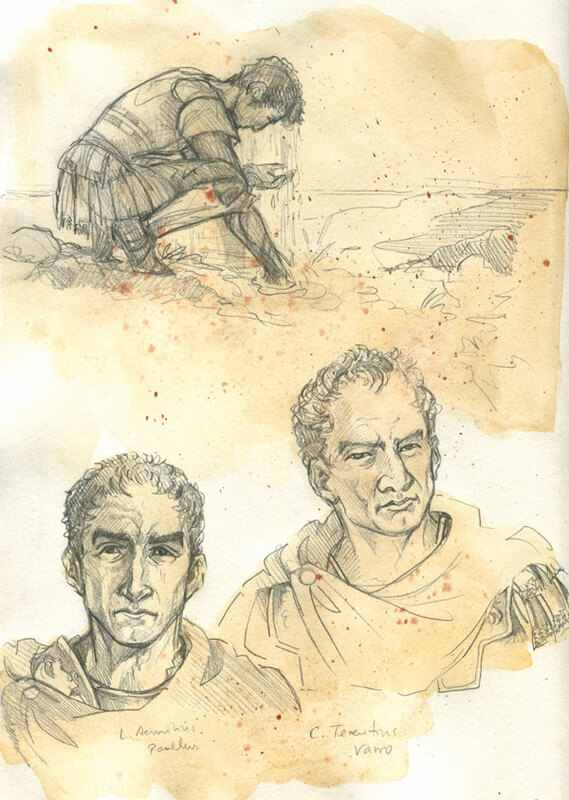 Bottom: Aemilius Paullus and Terentius Varro, the ill-fated consuls at Cannae. First ink test. Not exactly what I wanted – too clean. Second ink test – NOW we’re talking! Aemilius Paullus in the last moments of his life. 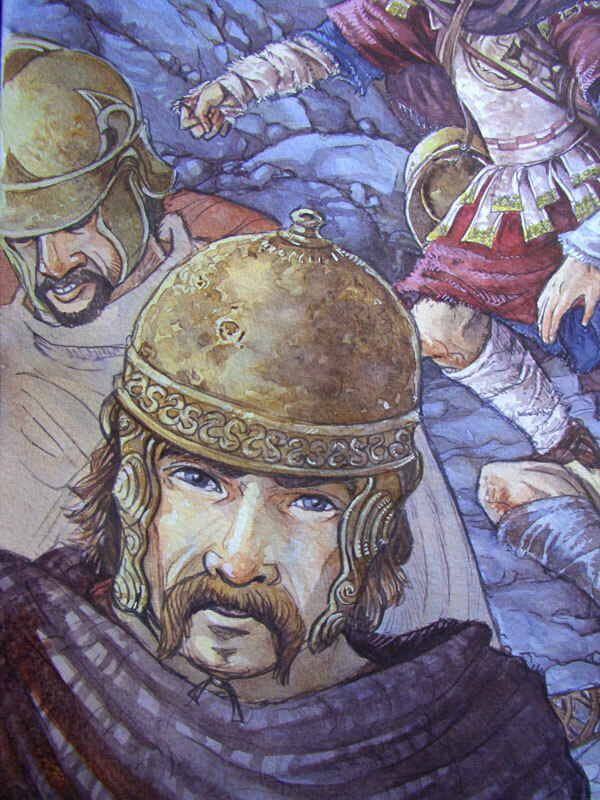 Servilius Geminus was dead, hacked to pieces by several Iberian swords at once. Furius Bibaculus was dying, run through with a spear. The legates’ bodyguards were just being cut down along with them. Lentulus had drifted into view and out again, shouting at him, but the words had made no sense. 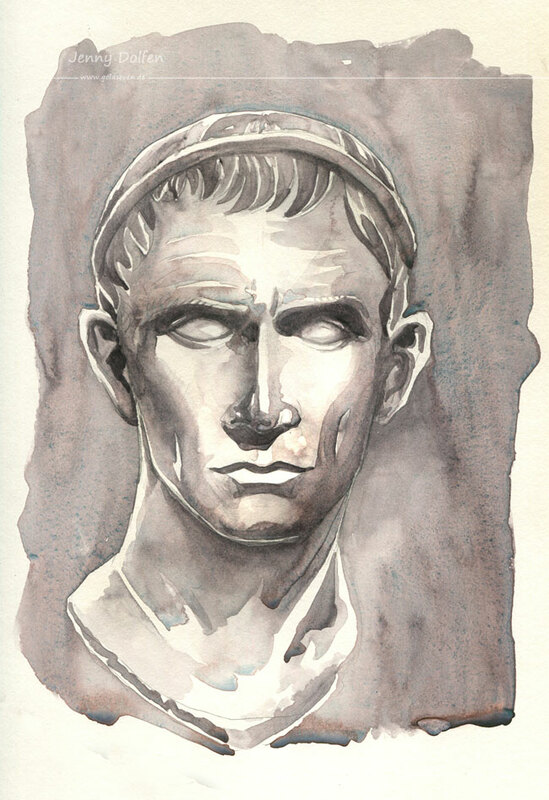 Claudius Centho was dead, defending the consul, who was in a state of shock and utter disbelief. 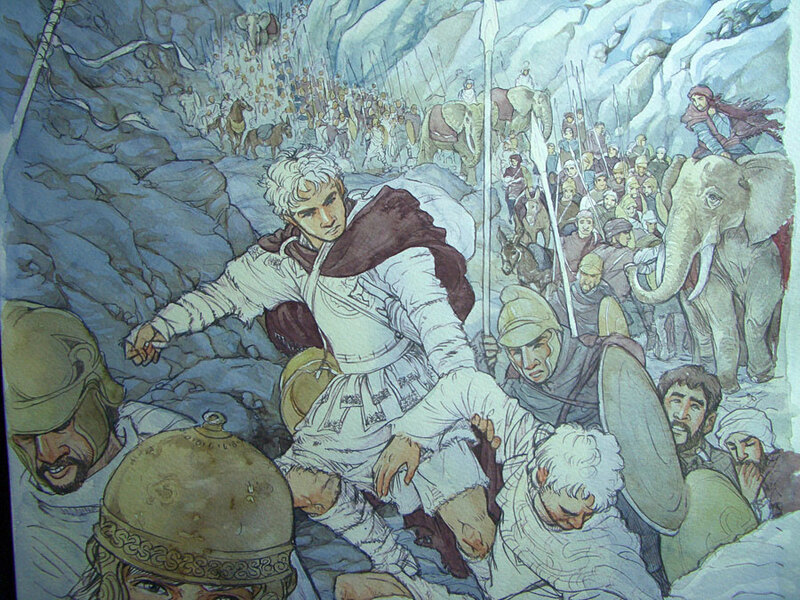 Aemilius Paullus had left the dying right flank, only to die in the centre. I have a new favourite medium: ACRYLIC INK. I can’t believe how good this stuff is. It’s like the answer to all my failed acrylic and gouache experiments. A medium for transparency-fanciers who want to paint opaquely. Once in a while. But are scared of pasty paint. I just love this medium. The world was lost in fog. 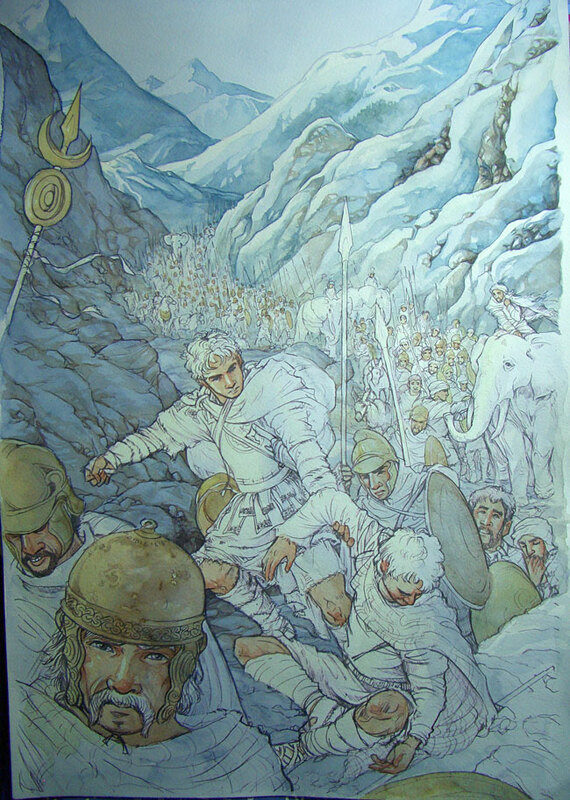 The sun should have been up by now – it must be up, judging by the dim, milky twilight that had replaced the clinging, misty darkness – but the lakeshore, the hills, the trees and bushes, even the thirty-thousand men all around were invisible, all but Hannibal’s guard and a handful of Gaetulan spearmen closest to him. The fog had swallowed all. The rocky slope in front of him vanished a short distance from his feet. Covering all the blinking metal parts turned out to be an unnecessary precaution. We could all be waving red flags, he thought; nobody would see. Even the noises seemed dimmed. The soldiers behind Hannibal, the Gaetulan skirmishers with the heavy Libyan infantry further down the slope to block the exit from the trap, had settled into breathless silence barely interrupted by whispers. Every metal part was wrapped in cloth to prevent them from clanking. Even the few officers’ horses behind him were almost as silent as the men. There was the tiniest clinking of tack when one of them shook himself restively. Three Iberians of Hannibal’s guard, positioned behind the general, had even coaxed their mounts to the ground. One of the animals gave a little restless nicker, before his master’s ear-scratching quieted him again. The horses were used to this; Hannibal had often marvelled at the horsemen’s skill in keeping their mounts hidden and quiet while lying in wait for an ambush. The trees and bushes, the hills, the entire lakeshore lay waiting. Thirty-thousand were waiting. There were no messengers, no horn signals. 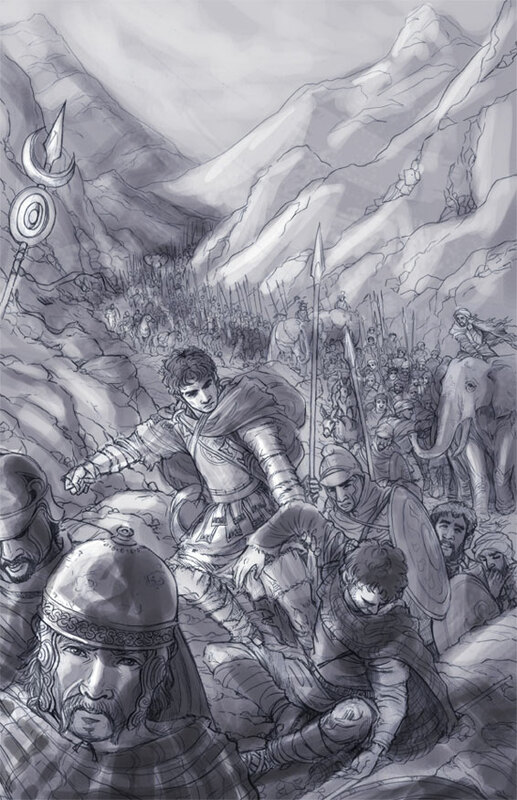 Hannibal had a few quick runners with him, as well as a handful of mounted messengers, but all his officers knew what was to be done, and he would use messengers only if something went horribly wrong and the others had to be warned. But if anything did go horribly wrong, chances were he would be the last to know. 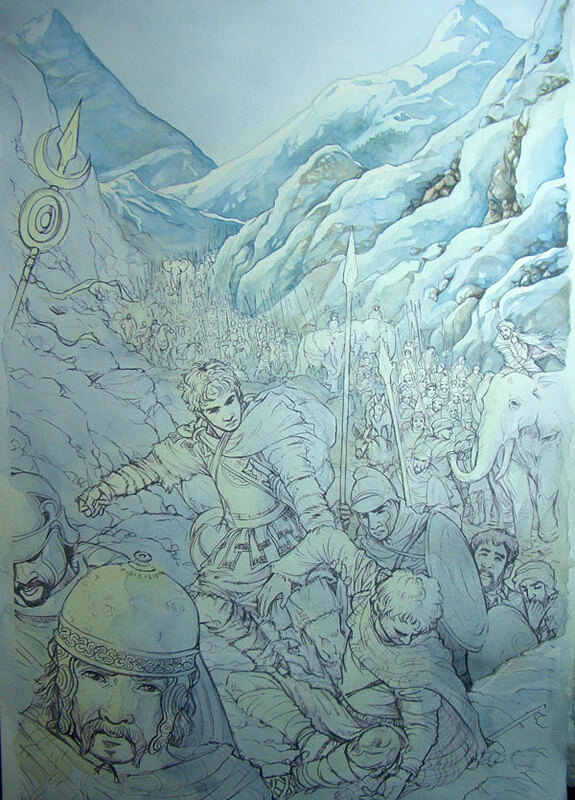 Maharbal was stationed at the entry of the narrow pass along the lake. If all went according to plan, the Romans would now be filing past him. Two horn-blasts when the last of the Roman column had passed the entry into the valley; one horn-blast if they detected the trap. Not a sound. The horns were silent. Someone behind him stifled a groan as he stretched aching muscles. They had taken their positions on the slopes two hours ago, at first light; the waiting was becoming more and more agonizing now that the day had finally come. The inability to do anything was almost unbearable. Hannibal stared into the fog as if he could force it to reveal its secrets to him. His dead right eye started watering; it still felt unfamiliar to have a half-vision only, even if today, all were equally blind. And after all, in the country of the blind, the one-eyed man is king. The twilight grew brighter, but still the fog didn’t lift. When the wind brought snatches of voices, hoofs and the marching feet, a shudder seemed to go through the men behind; there was the briefest outbreak of a hissed “They’re coming!” and hurried prayers in at least three different languages, quickly silenced. Hannibal stared into the mist below. The sounds below were getting louder and nearer, slowly, very slowly. Marching feet, the neighing of horses. Snatches of conversation in Latin, even snatches of laughter, but still there was nothing to be seen. They have no idea, Hannibal thought, overwhelmed. Yes, he had counted on this, had planned for it, had assured his officers and his men of it, but now, the Gods had truly laid everything into his hands. The fog, the natural ambush site provided by the lakeshore, and incredibly, the utter artlessness of Gaius Flaminius. 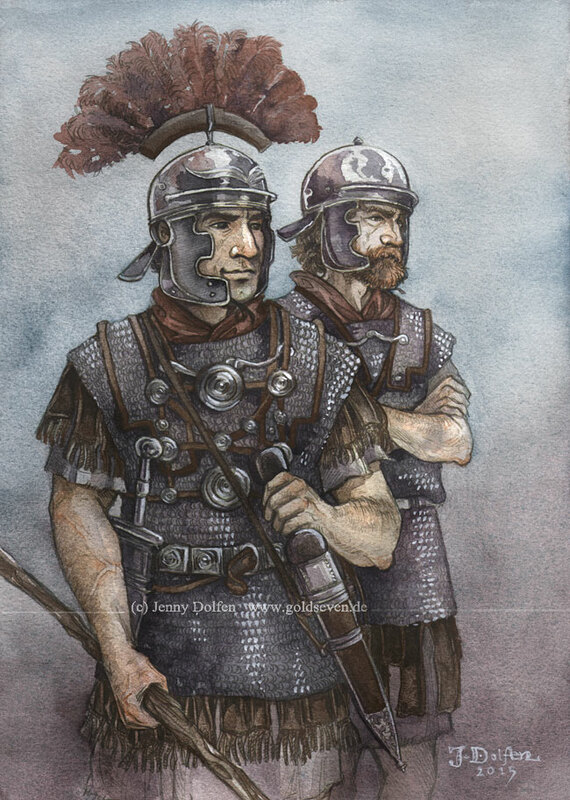 There was nothing to indicate the Roman consul had sent out any scouts, or his Libyans would have encountered them by now. Flaminius knew Hannibal was just a day’s march ahead of him, but he was leading his army into this misty valley without a shred of caution. Forty thousand men marching blindly into their doom. Then, two horn-blasts from the far end of the shore. The trap was sprung. The jaws closed. “Servilius Geminus was dead, hacked to pieces by several Iberian swords at once. 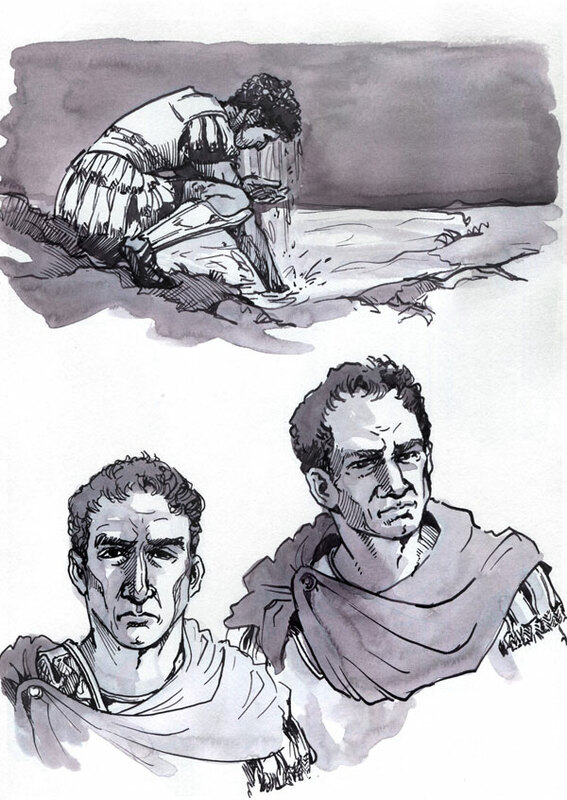 Minucius Rufus was dying, run through with a spear. The legates’ bodyguards were just being cut down along with them. 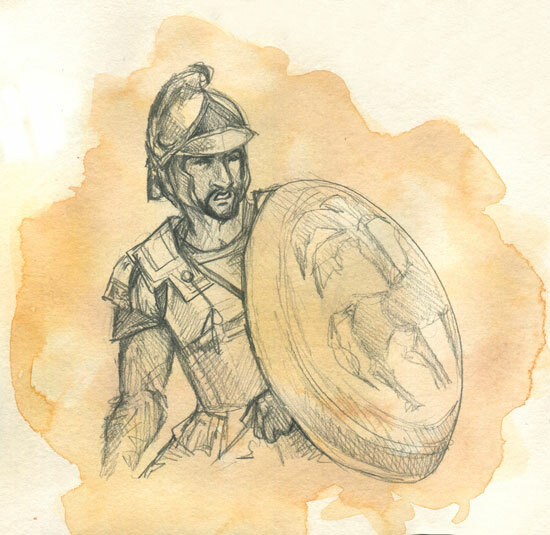 Centho was dead, defending the consul, who was in a state of shock and utter disbelief. Lentulus had drifted into view and out again, shouting at him, but the words had made no sense. Just a quick sketch done on, yes, a bowling alley. And yes, there is a connection. My son turned nine yesterday, and today, we invited his friends for bowling (or, more precisely, the German variant, Kegeln). 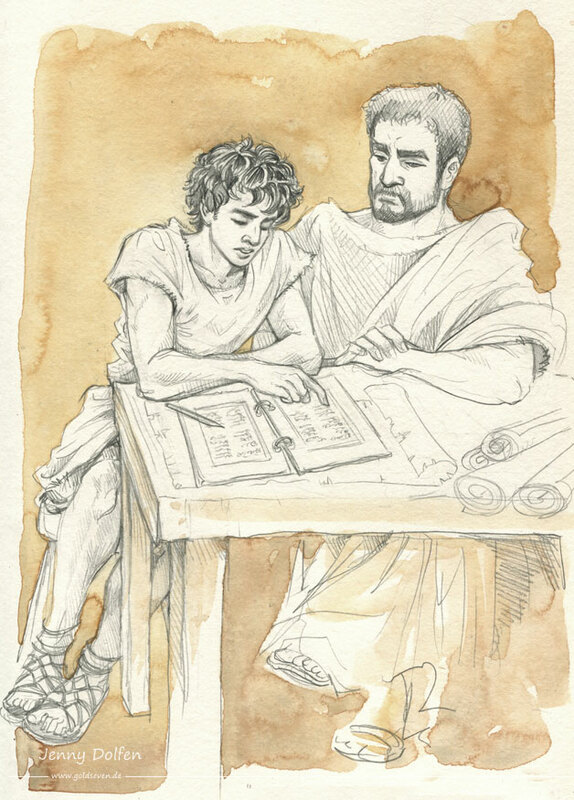 The kids were having fun and they were exceptionally well-behaved, so I had some time to get some sketching done – of an equally nine-year-old Hannibal standing next to his father in the temple of Baal Hammon. That scene is going to need a stronger illu at some later date. When I’m not on a bowling alley and the light is better. 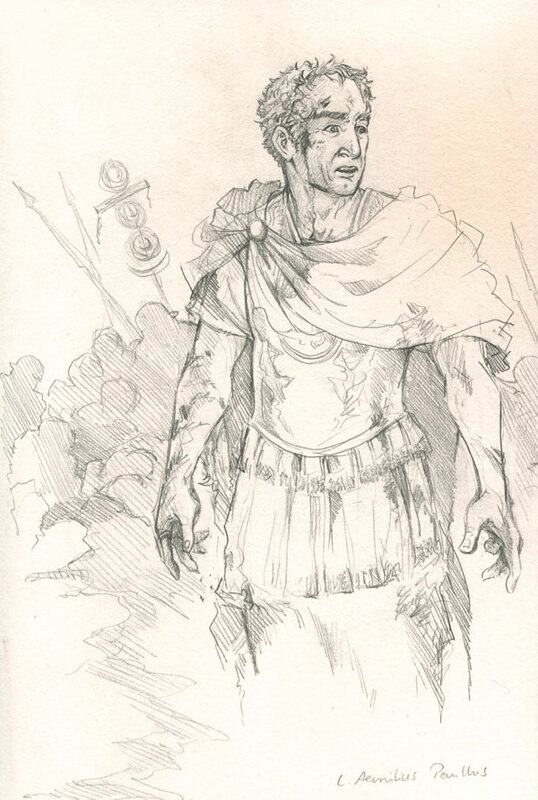 A similarly simple sketch of Antiochos III, done last week. With reference – a marble bust in the Louvre. 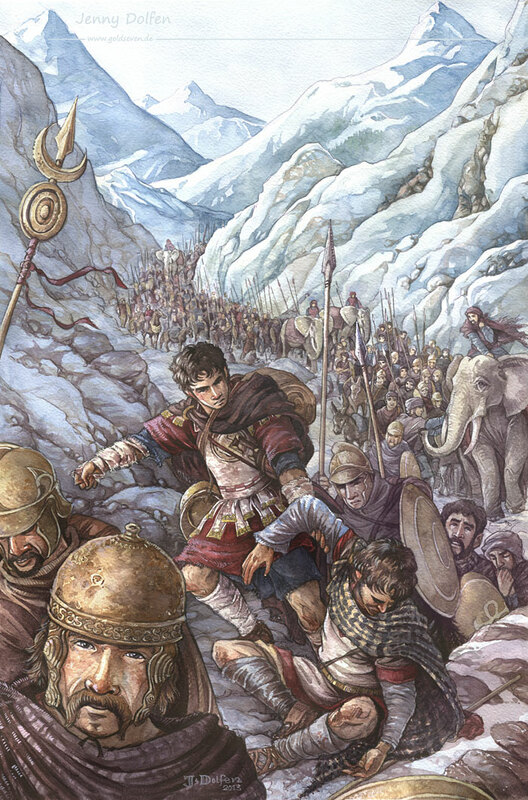 This piece really gave me a hard time, but it’s probably very fitting that, in mid-October, I struggle with a piece depicting Hannibal struggling with the Alps in mid-October. My losses were in paper and pencils rather than mules and men, but it seems crossing the Alps isn’t meant to be easy. The lineart stage alone took me a week and four pieces of paper as I redrew this bit and that and put the pieces back together again. The colour was even tougher. I don’t think I’ve ever painted anything as complex as this. I’d say I mostly succeeded. Another parallel there. Before I started, I made myself a greyscale sketch in Photoshop, so I knew where to get how dark in the final piece. Then I mixed some Phtalo Blue, Indigo and Shadow Violet in one compartment of my palette, some Ochre in another, and then some reddish brown from leftovers I had in my palette (probably mainly Burnt Sienna, Piemontite Red, and Sepia). I sprayed my entire canvas with water and added a very light blue wash, then going into all the bits that are exposed to the light with extremely thin Ochre. Then, when this had dried, I painte a rather uniform pale blue sky. The picture is going to be busy enough; when everything else is done, I’ll decide how many clouds this piece can handle. 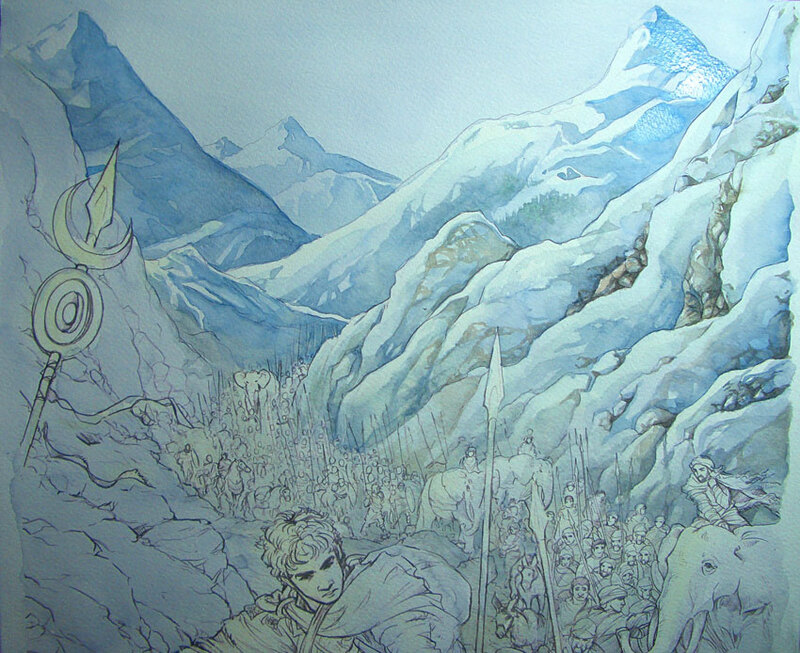 Next, I started painting the mountains in the back of the image. 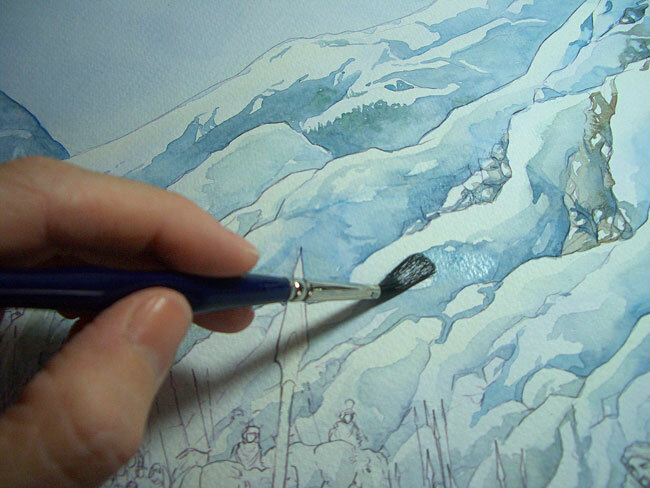 I used a pale Blue, mainly Phtalo, and painted the “negative space” around the snow. I mixed in some green to suggest a few trees further away. Then I went about detailing the rock-faces closer to us, with mixes of different blues (more Pthalo here, more Indigo and Shadow Violet there), intermingled in the shadows and rockier parts with different, toned-down browns I mixed above. I make sure never to get too dark, but more and more detailed towards the front. 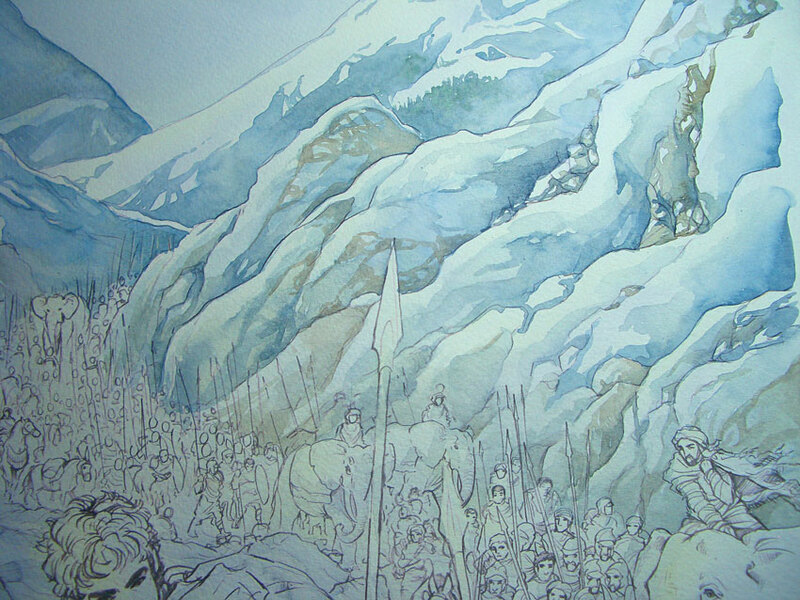 More details and deeper shadows to the rocky bits. I painted a thin brownish/bluish wash across the army and the space below them, to tie them in with the surroundings. 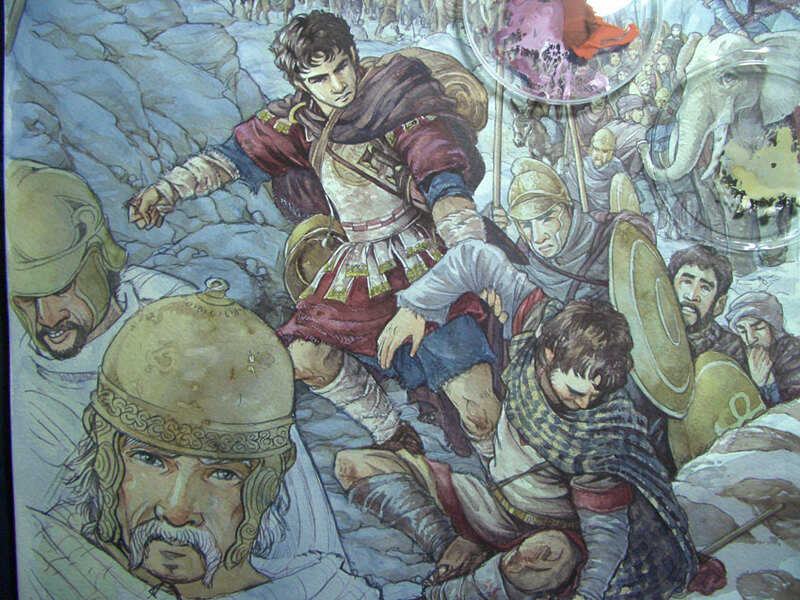 The group of three men, immediately behind Hannibal and the soldier he’s pulling to his feet, is overlaid with a muddy wash so they won’t distract from the two later on. 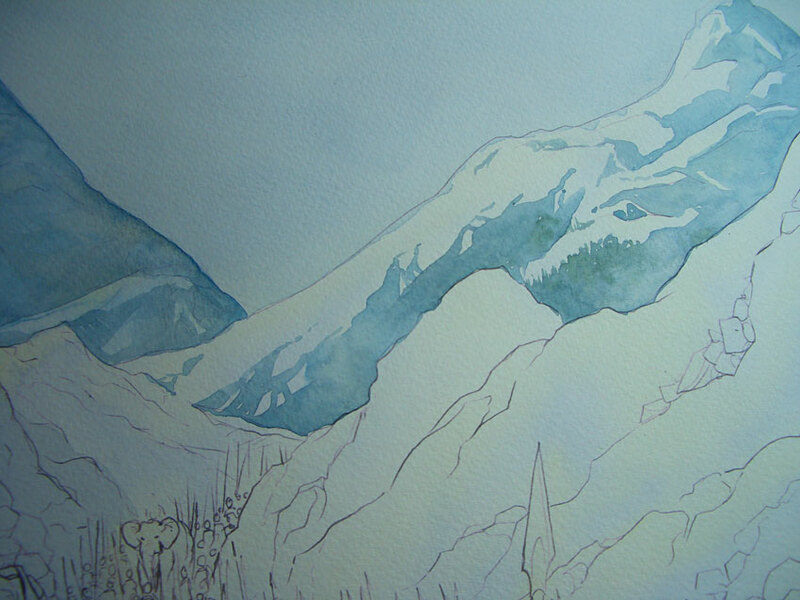 I then decided the empty triangle of sky could well use another mountain, plus a few bluer shadows on the other mountains, which I painted in with Phtalo and Indigo. Next, I set out to paint the mountainside to the left. It’s completely in shadow, and I mixed some more reddish tones into the blue. Down there, you can already see me detailing out the rocks with a brownish wash. The colour consists of everything I have on my palette at this point. Finished detailing. 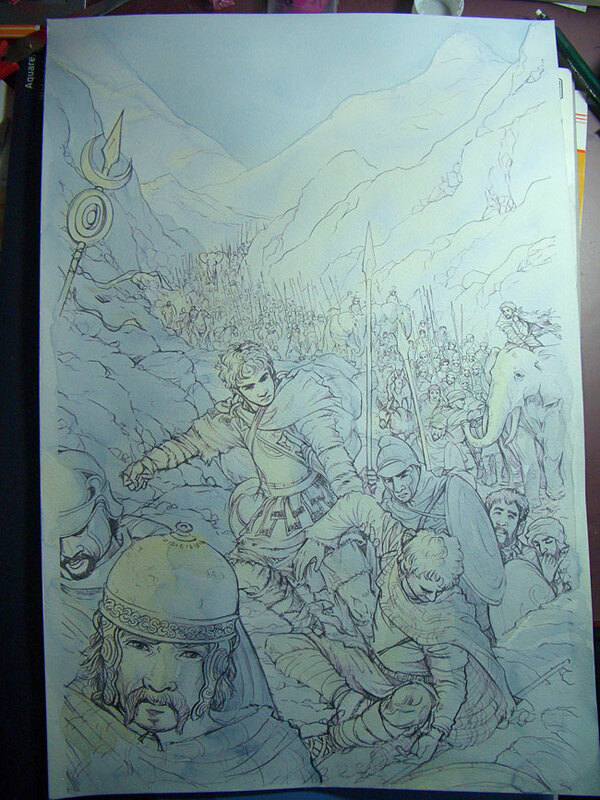 Not too much – I want the detail to be almost lost in the rock face later on, enough to look finished and non-monotonous, but nothing to distract from the figures. Next, some skin, bronze and leather. 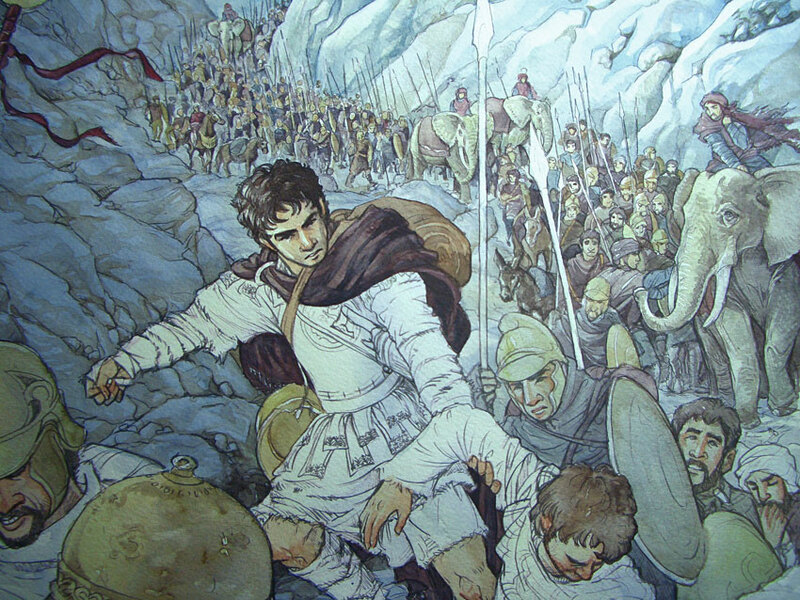 Outfitting Hannibal’s Libyans with warm winter clothes. Quiet there in the back, I’ll get to you eventually. The elephants go first. More detailing of the figures in back. Simultaneously, I determined how dark my darkest spots would be in this image – Hannibal’s hair – to set off the rest against it, and to have something to check the column against, to keep myself from getting too dark in the background. And well, after fiddling with hundreds of little figures for hours that don’t look like anything, I needed something rewarding to paint. In this painting, my approach is very un-classical. Instead of going strictly from light to dark, I made sure to lay done some guidelines, shapes through the painting, forcing myself to keep an overview rather than getting lost in the details. 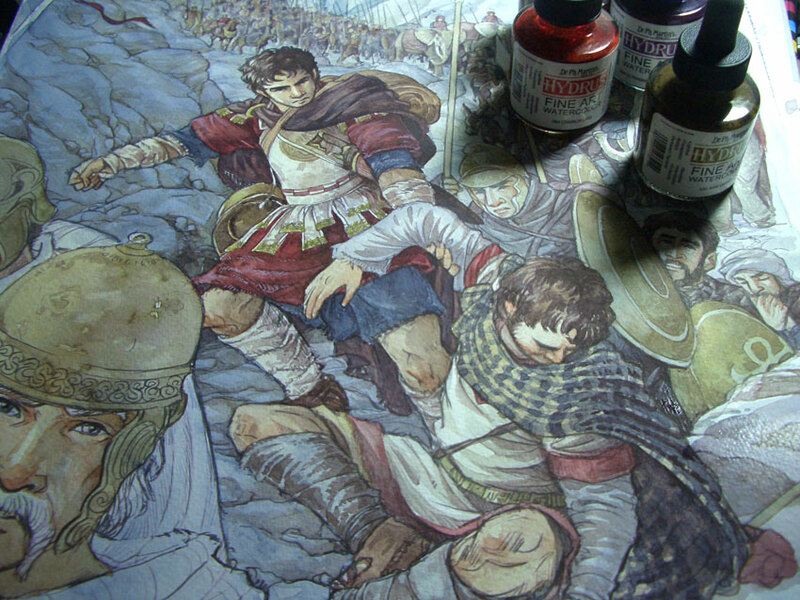 So this is where the mixed media part comes in, and I mixed some dark burgundy with gouache and fixed that sword thing. Next, I added some bright colours (not gouache this time, still sticking mainly to the colours I’ve previously used) for Hannibal’s clothes. They’re too bright as of now, but I plan to make generous use of dark shadows and liquid watercolours to tone them down and add that extra punch that liquid watercolours excel at. 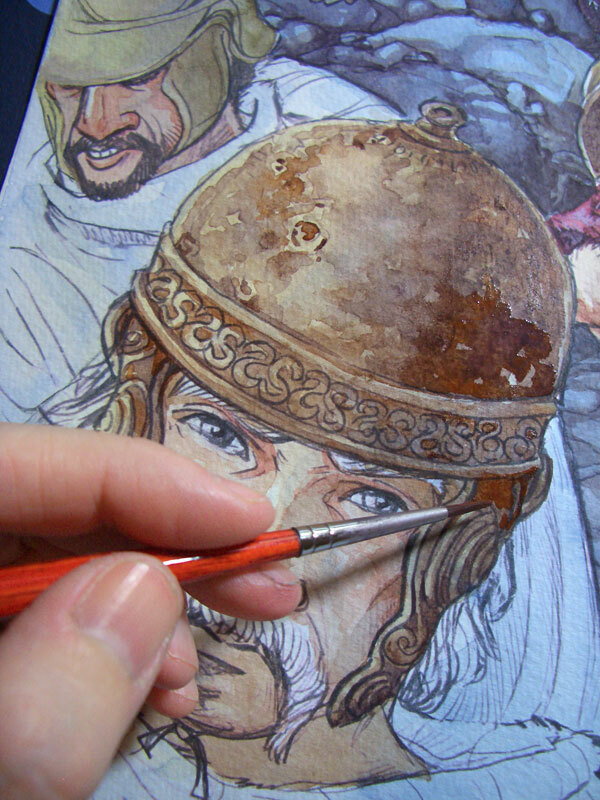 The shields of the men in the back have also been detailed with a mix of ochre/Burnt Sienna/violet mixes already in use. No new colours have been introduced here. I also painted over the entire army in the back again with a good brushful of dirty water. That got rid of the little white flashes of unpainted whites everywhere, and tied them together neatly. I’ll go in later to pick out some bronze helmet highlights. Liquid watercolours in action, picking out shadows. Some gouache too, for lighter highlights, which I rarely do, but which are needed here. The colours look off in the photograph; the original looks much better. As gouache palettes, I always keep the plastic lids of Chipsletten crisps (Pringles-like,but Chipsletten taste better). They’re the perfect size and quality for palettes on an overcrowded desk like mine. The epiphany of the week came with the realisation that a watercolour that looks off is ruined, and a gouache painting that looks of may just not be done yet. That’s a concept I never really grasped. The next step will be to understand how to go on. I manage well enough with gouache in metal and clothes, but skin is not very successful yet. A part of me refuses to paint skin with anything opaque, which seems to be my problem. And the clothes of the men in front. 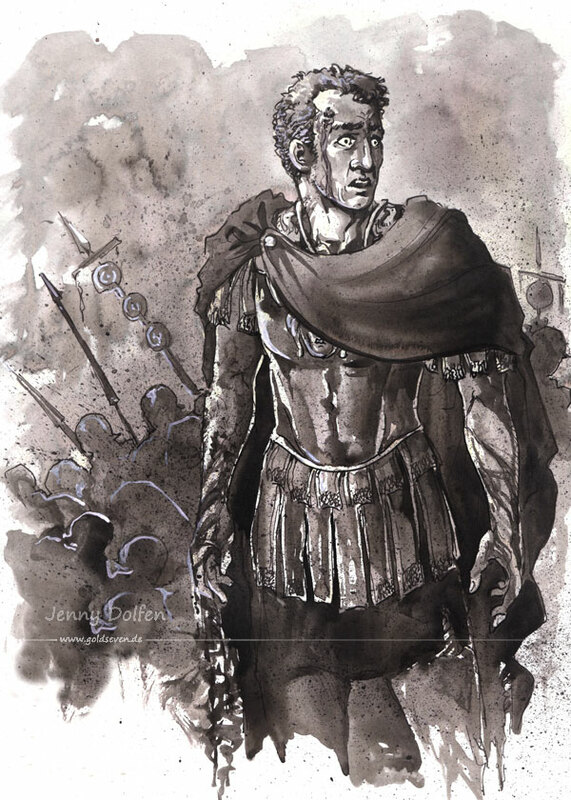 We know next to nothing about Hannibal’s youth, save for one thing that I, personally, find very touching: He learned Greek, from a Spartan turot called Sosylos who later followed him on his campaigns as a historian. When I did my Graecum at University and struggled with the Greek conjugations, especially δίδωμι, I often wondered whether there were any words Hannibal hated, too. I always thought it was funny that I understand not one but two languages, Greek and Latin, that Hannibal also spoke. And of course, if you’re a Latin teacher, you’re so used to fifteen-year-olds with thin arms and legs and huge feet slouched on chairs in deep concentration, questioning every task you make them do.